Imagine crackling embers snapping and popping as you sit underneath the stars on a cool spring or fall evening. The kids run around excited at the prospect of toasting marshmallows as you bask in the warm swirling air and gaze at flickering illuminations that the orange and yellow flames make on the stones of your custom handcrafted outdoor fireplace. An outdoor fireplace provides a wealth of functionality and ambience to your outdoor living space. 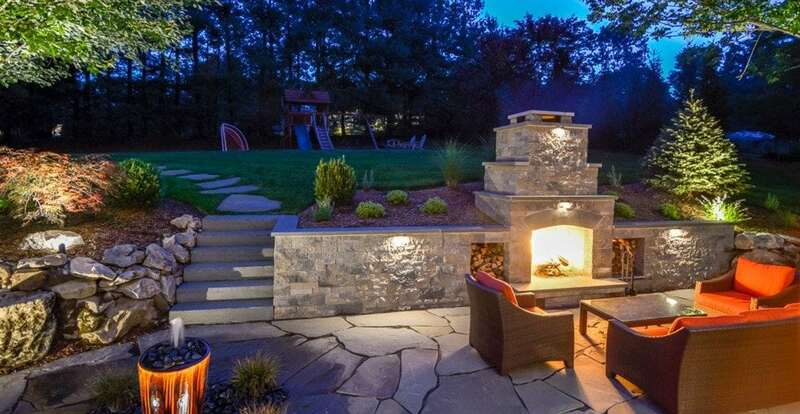 Whether you are looking for ways to extend the seasons, boost your custom décor, or add value to your home, designing a fireplace or fire pit that fits your backyard is an excellent idea to upgrade your lifestyle for Summer 2015. Sitting next to one of nature’s most captivating elements creates a calming atmosphere, sets a mood, encourages relaxation, and provides the perfect centerpiece for entertaining. What starts out as an afternoon pool party with friends can easily evolve into cooking shish kabobs for dinner and toasting marshmallows long into the night. Adding an outdoor fireplace to your landscaping allows for versatility in transitioning between day and night. Seasons no longer dictate the amount of time spent outdoors. Enjoy more time outside with those you care about most by including a fireplace in your outdoor design. While elegant patio furniture and chachkas can display your distinctive style and taste, a fire element can dramatically enrich and illuminate your outdoor living space. Setting your patio, pool or kitchen aglow will highlight and magnify the distinctive design elements in your unique landscape design. Whether you want to show off your Bluestone terrace or Belgium Block outdoor kitchen, emphasizing the features in your design with a custom glow will positively affect your entire outdoor space. Increase the value of your home and offer more living and entertainment space for the entire family. Add a fireplace or firepit to your patio, and invite warmth, comfort, function, and style to your outdoor living space. For some great design inspiration, click here. For more ideas about Outdoor Living Spaces, click here.